One animal no one wants to encounter on a hike is a tick. These small arachnids crawl onto passing animals like birds, reptiles, amphibians and mammals. After embedding sucking mouthparts into their host, ticks feed on blood, ballooning to several times their original size. The most common tick you may encounter on you or your pet, the American dog tick, resembles a grayish, blob-shaped M&M when fully engorged. Gross! Luckily, it takes several hours for a tick to embed into skin and start feeding, and diligent checking will usually allow you to remove these bloodsuckers before they begin their meal. Ticks have surprisingly complicated life cycles. They undergo a growth cycle that encompasses different stages of development, referred to as larvae, nymphs, and adults. 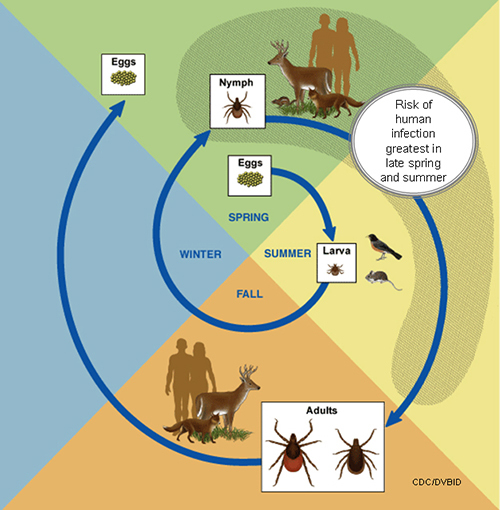 Interestingly, most ticks prefer to have a different host to feed on during these different stages of life, for example, feeding on a bird as a larva, a deer as a nymph, and a human as an adult. Depending on the species, some ticks may pose health threats to us as larvae, nymphs, adults, or a combination of the three. There are over a dozen tick-borne diseases known in the U.S., though not every species transmits them all. 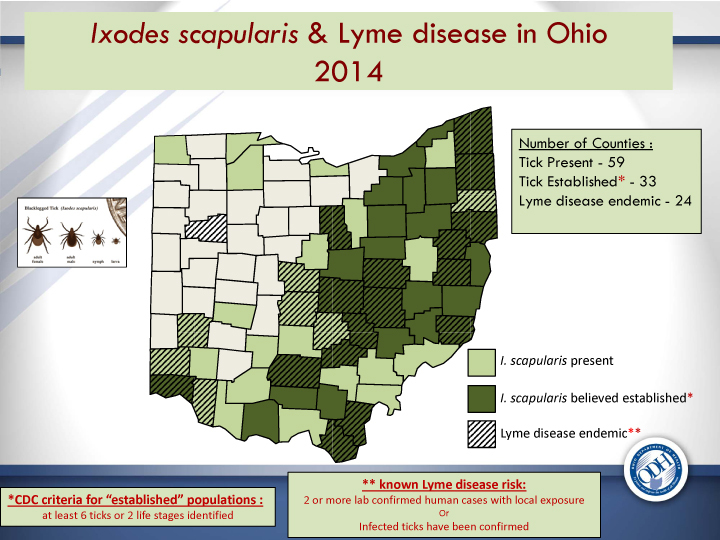 For example, the American do tick (by far the most commonly-encountered species in Northeast Ohio) may carry Rocky Mountain Spotted Fever and tularemia, but it can’t transmit Lyme disease. Knowing the ticks in your area and how to protect yourself is the best way to prevent disease. 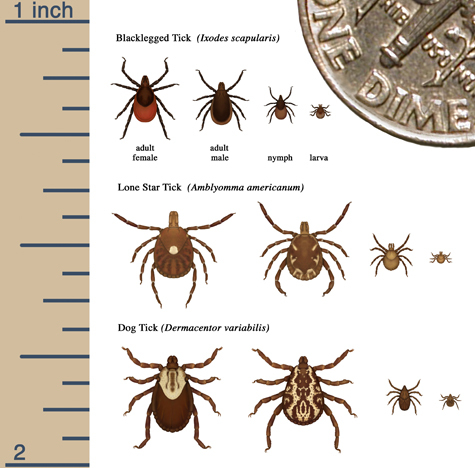 One tick that is becoming an increasing health threat is the black-legged tick, also called the deer tick. Populations of this species have increased dramatically in Ohio since 2010, and their range continues to expand throughout our state. Black-legged ticks are the species known to transmit Lyme disease, so it’s important to know what to look for. Black-legged ticks prefer a forest habitat, and you need to look out for them all year as they can remain active even during winter. It takes a keen eye to spot a black-legged tick; as nymphs, these pesky blood-suckers are only as big as a poppyseed. Check your body thoroughly when returning from a trip to the forest. If you do find a tick on you, don’t panic. It usually takes a tick a couple of hours of wandering your body before it settles down to find a good feeding spot. Once a tick inserts its mouth tube into your skin and adheres to you using its cement-like saliva, the tick is “embedded.” In most cases, removing a tick within 36 - 48 hours after it is embedded prevents the transmission of Lyme disease. Calmly grasp the tick behind its head with a set of tweezers, and pull slowly and firmly to remove it. In the future, help to keep ticks at bay by tucking your socks into your pants and wearing a DEET insect spray. Protect your pets by keeping dogs and cats on a monthly preventative for ticks.